You can protect your favorite volumes and show off some of your prettiest fabric scraps at the same time by sewing book covers. All it takes is about half an hour and some basic supplies to transform your bookshelves with colorful prints and patterns that compliment your decor. You don't need any previous sewing experience to make this simple cover. This is a fast and easy project when you use a sewing machine, but you can also sew a cover by hand if you don't have a machine handy. Begin by measuring the height of the book. You'll need to know the height of the cover from the top to the bottom. Add one inch for a seam allowance. Next, find the width of the entire cover from one side to the other. To get this, measure with the book closed. Start at the open edge on the front and measure the width of the cover all the way to the spine. Multiply this number by two to include the back cover as well. Then measure the width of the spine. Add the spine measurement into the total. Add six inches to this measurement to accommodate the seam allowance and the flaps inside the book. 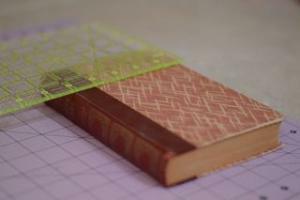 Lay out a piece of heavyweight fabric and cut a rectangle that is one inch larger that the width and height of your book. 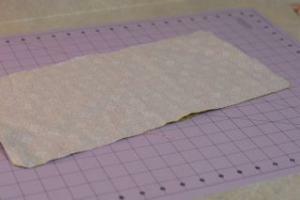 Cut an identical rectangle from the thin cotton fabric. Stack the two rectangles with their right sides together. Pin all the way around the rectangle. Sew almost all the way around the rectangle, using a 1/4-inch seam allowance. Leave a four-inch opening for turning in the center portion of one long side. Clip the corners at an angle. Remove all pins. Turn the cover right side out, using a chopstick to make sure the corners are fully turned. Iron the cover. Set your sewing machine stitch length to 3.0 and top stitch the shorter ends of the rectangle, about 1/4 inch from the edge. Place the cover on your work surface with the exterior, or heavyweight, fabric down. Place the open book on the cover with the spine centered over the mid-point of the cover. Close the book and fold the cover over the book. Tuck the remaining fabric inside the front and back covers of the book and secure with pins. Open the book and remove the cover. Ensure that the flaps are even on both sides. Cut a length of ribbon that is about three inches longer than the book. Insert the ribbon into the center of the open portion of the long side. Pin to hold it. Top stich 1/4 inch from the edge along the bottom edge and top edge of the cover, securing the flaps in place. Remove the pins and put the cover on your book. 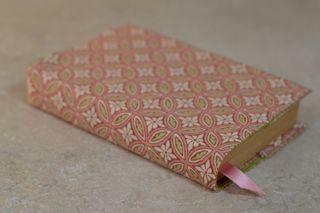 Sew a ribbon into the spine area of the cover to allow the book to be tied closed. This is a great option for journals. Applique a favorite image on the front of the cover. You can use an applique pattern or make a freehand design. Embroider the title of the book, a monogram, or another phrase onto the cover. You could also embroider the spine to make it easy to identify the book on a shelf. Don't limit yourself to heavyweight fabrics for the exterior. You can use any fabric if you add interfacing to give it stiffness. If you enjoy quilting, create a pieced cover in one of your favorite designs. If you prefer e-readers to traditional books, consider making a Kindle cover instead of this book cover. A special book cover is a great way to protect your most precious volumes, and it's also a fun beginner sewing project. 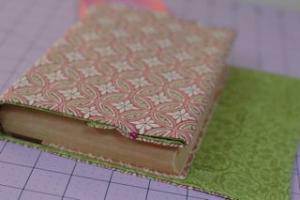 You can even sew these covers as gifts, since they add a gorgeous, handmade touch to purchased journals and sketchbooks.